A mere year ago, I could have never started this blog, because until very recently, I cooked mostly European food. I know! Crazy, right? For some strange reason, I got it into my head that Asian food is complicated to cook: intensive labor, hard-to-source ingredients, lack of great recipe resources. I am reminded of the introduction to Claudia Roden's "Book of Middle Eastern Food," in which she explains that in Egypt, recipes simply weren't publicly available—they were passed down within families like treasured heirlooms. Even today, the number of truly great, authentic Chinese cookbooks available in English can be counted on one hand. We are talking about one of the oldest cuisines on earth, with literally tens of thousands of recipes. Thankfully, my mom is pretty modern (and an excellent cook). So when she divulged her recipe for niu rou mian—pretty much the quintessential Chinese noodle soup—I took notes. She also happens to hail from Taiwan, known to nrm enthusiasts as "heaven on earth." Her method calls for making a broth from beef shank, then separately making up a sort of tarka to toss into the broth. This combination then stews for about four hours, slowly turning the humble shank into luxuriously tender meat. Definitely do not undertake this project on an empty stomach! 2. Heat the oil for the seasoning paste in a medium-sized frying pan. Add the sugar and stir until completely dissolved and just starting to caramelize (you will see a golden brown color appear in the bottom of the pan). 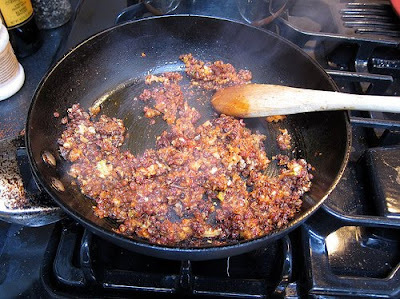 Then add the rest of the seasoning paste ingredients and stir vigorously for about 90 seconds. 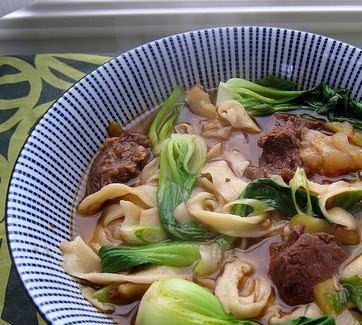 This will smell fantastic, and you will want to eat a bowl of beef noodles right on the spot. Not so fast, my friend, you've still got three or four hours left to go. Throw this delicious mixture into the broth pot. 3. If using tendon in your soup, simply boil it whole in a separate pot over medium-low heat until tender (about 2½ hours). Make sure to keep topping up the water level if necessary. Chop into bite sized pieces and add it to the main soup pot. Note that tendon will dissolve if you cook it for too long, so you may want to keep this aside if your soup isn't close to ready yet. 5. About 15 minutes before serving, add soy/salt to taste. I added about 2 tablespoons of low sodium soy sauce and a quarter teaspoon of salt. Remove the peppercorns and star anise with a Chinese spider or skimmer. If you miss a few peppercorns, don't worry. They're edible, just a little bitter. 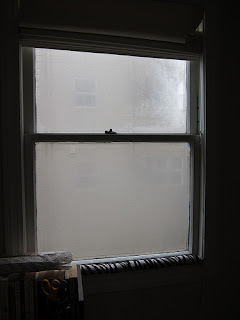 Bonus: making a big pot of nrm will steam your windows up on a cold SF day. This is ridicu-licious. Even on the slight off-chance that I could acquire these amazing culinary skills, the six hour wait would still kill me. sounds delicious! 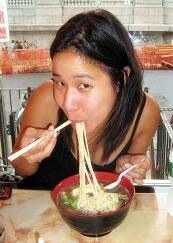 i even may have to try this incredibly outrageous idea of -gasp- making my own noodles sometime! @BK, oh, but once you've made it, you've got the best leftovers on earth for about a week. And they only take about 15 minutes to heat up. Mad culinary skills not required, I promise. This looks fantastic! Your pic is great, too. btw, which chinese cookbooks in english would you recommend? Yes, Fuchsia Dunlop is one of the authors I would recommend. To be honest, I've had more luck finding Chinese recipes online vs. in cookbooks. Red Cook and Appetite for China are both excellent resources. I also just ordered the out-of-print book: The Key to Chinese Cooking by Irene Kuo, and will likely post my thoughts here once I've cooked from it. Thanks, I know both of those excellent blogs. I look forward to hearing your thoughts about the Kuo book. Also, do you know any good Korean blogs books? After eating in a Korean restaurant recently, I fell in love with the bold flavours of Korean food, and I'd love to cook some myself. @maninas Drop everything you are doing and go to Maangchi's website. I've tried her kimchi and soon dubu recipes (click the "Korean" tag on the left to see those entries) and both turned out great. Also, her videos are wildly entertaining. This soup sounds really tasty! looks like crap from the original stuff you can get at restaurants... you forgot to add ginger. Thanks for posting this recipe. My wife and I made this all day along with some green onion pancakes to help usher in the year of the Rabbit with our son who is adopted from Taiwan. It reminds of our trip to Taepei and Tainan. Thanks! !I will warn folks it can get very spicy. We were able to find all the ingredients at a local Asian market and while time consuming (which is fun for us), it was not difficult to make at all. I just busted out a version of this, and it was excellent. I was drawn to this site because of the homemade noodles, by a circuitous route; I've made Italian, Japanese, and German/American style noodles before, but for some reason, not Chinese. I'm currently living in Montana, a real-Chinese-food wasteland, and this hit the spot. Despite the 6-7 hour prep time, it was still way quicker than a trip to Seattle, Portland, or SF. I used oxtails instead of the shanks and tendon, because I had them on hand,and they stood in well, and I decreased the spice level by about a third, which was a mistake. I am a spice junkie, but my wife is not. While the broth I made was excellent, I'll not be afraid to amp it up in the future. The noodles were dead easy. Thanks for providing a cool drink of water (or hot noodle soup) in this Chinese food wasteland. This looks great! About how many servings does it make? We're having a party this weekend and I'd love to serve it, but want to plan accordingly. Thanks for posting the recipe! This serves four greedy eaters or six reasonable ones. Hope you enjoy it! I love any recipe that calls for 6 tablespoons of sichuan pepper!!!! For people who want to decrease cooking time, use a pressure cooker, and the cooking time is 1/4 as high temperature breaks the collagen down quickly. Thank you so much for posting this recipe! I had a favorite restaurant in Houston where I would get this weekly, but since I moved to DC 7 yrs ago, I still haven't found a restaurant that serves this soup! This definitely satisfied my cravings. But I looked all over town for szechuan peppercorns and I ended up only being able to find ground szechuan pepper at William-Sonoma. I didn't know how much of that to use, so I estimated about 2 tbsps of ground. I think it was too much and the broth came out way spicy! I ended up having to dilute the soup afterwards, but it was still good. Good thing I can order some 小籠包 to hold me over. Have made this several times for my husband since our favorite noodle place closed down in Dallas. This recipe is delicious and spot on. The noodles were also very easy and comes out perfect each time. Thank you so much! I made this reciepe today and it was absolutely delicious! kt, what brand of spicy chili bean paste do you recommend for this recipe? You know, I often just use Lee Kum Kee because it's very easy to find. However, I've uploaded a photo of the brand my mom likes best. (Sorry, it's the lid, not the label, because the label came off in one piece when I opened the jar). I just finished adding the seasoning paste to the broth and it smells amazing! Can't wait until the next four hours to pass... I'd say the hardest part for me was cutting up the beef shank! Skinny Taiwanese girl like me is not strong enough even with a serated knife haha! My boyfriend owes me after making him this dinner :) Thanks so much for the recipe! Oh and I was supposed to trim off the fat and etc before boiling the beef shank right? I didn't want any of that in my meal! Was there a lot of fat in the shank? When I buy the shank, it usually looks quite lean, but there is a lot of connective tissue (similar to tendon) in the meat. 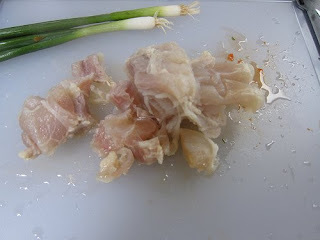 In general, when you are slow cooking these cheap, tough cuts, you do *not* want to trim any of the fat or connective tissue. That is what will make your meat moist and tender! You could remove the fat at the end, but I don't find that there is much fat. What can I say, this is not health food! do you grind the spices? No, as I mention in the recipe, you skim them off at the end. Though lately I've taken to putting all the toasted peppercorns into a little mesh strainer (like a ball for brewing tea), so I can skip this step. This recipe is amazing! Our family lived in Henan for a year, and ate a lot of hui mian. This broth is almost exactly the same. You have made us very happy. Thanks! 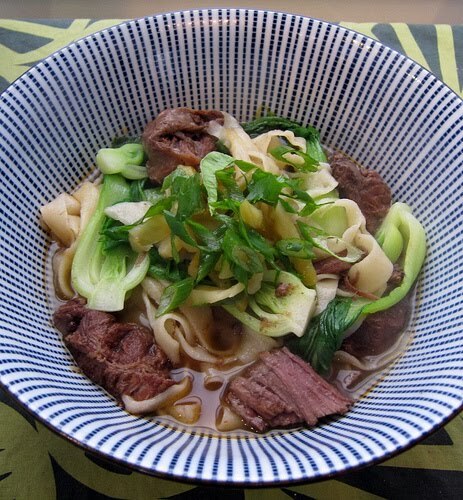 We too lived in China for 7 years and I was looking for an easy to follow recipe to make our favorite noodles...way to go! you nailed it!